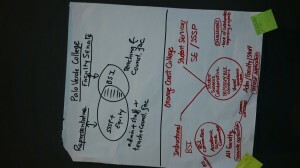 Participants create posters to show integrated planning efforts. 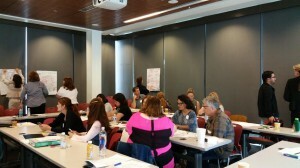 Huntington Beach, CA–Thirty-one educators from fifteen colleges gathered at beautiful Golden West College to hear Kirsten Corbin, Dean of Basic Skills and Special Programs at the California Community Colleges Chancellor’s Office, discuss the latest news regarding the Basic Skills Initiative. Some takeaways included learning that the format for the report due this October will return to the style it was two years ago. Kirsten also mentioned a current effort to possibly merge or align the SSSP and BSI reporting cycles and forms. 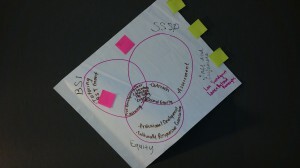 Participants also engaged in group work to discuss and display (through poster creation) their local efforts to integrate planning among SSSP, Equity, and Basic Skills.